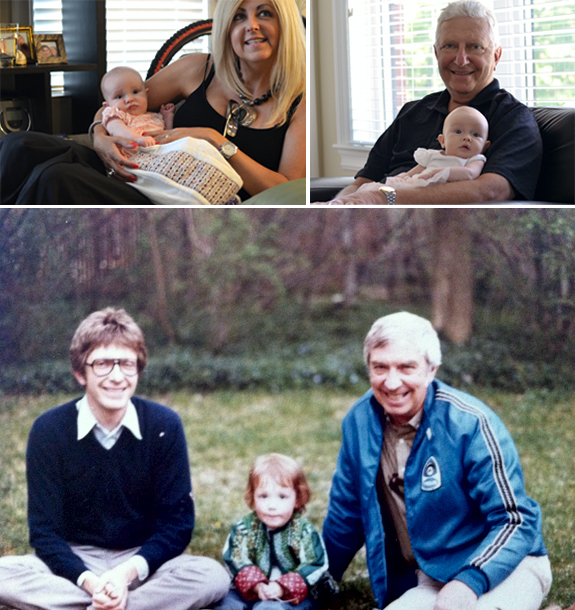 Alice & her Grandparents. Me with my Dad & Grandpa. Alice met some pretty special people over the weekend. More grandparents! But one person in particular was especially excited to meet Alice as she shares his name. Since Alice and I do not share a last name, it was important to me when naming her that she have something from my family. And since both my dad and my grandpa are named Glen, it felt like the perfect middle name for Alice. And so she became Alice Glen. My dad positively beamed as he held his first grandchild. And my beautiful step-mom glowed as Alice snuggled with her. They are absolute naturals at this whole grandparenting thing. My dad already has a laundry list of things he wants to teach her how to do (skiing & golfing are big priorities) and my step-mom can't wait to take her to do all things girly (I see a very fashionable wardrobe in this kid's future). Alice is so lucky to have so many people that love her. Nolan's middle name is Bryson, which is my MIL's maiden name. Jason was close to his mom's mom, and we felt it fitting. She died unexpectedly a month after Nolan was born, and never got to meet him, so we are happy we carried on the family name this way.